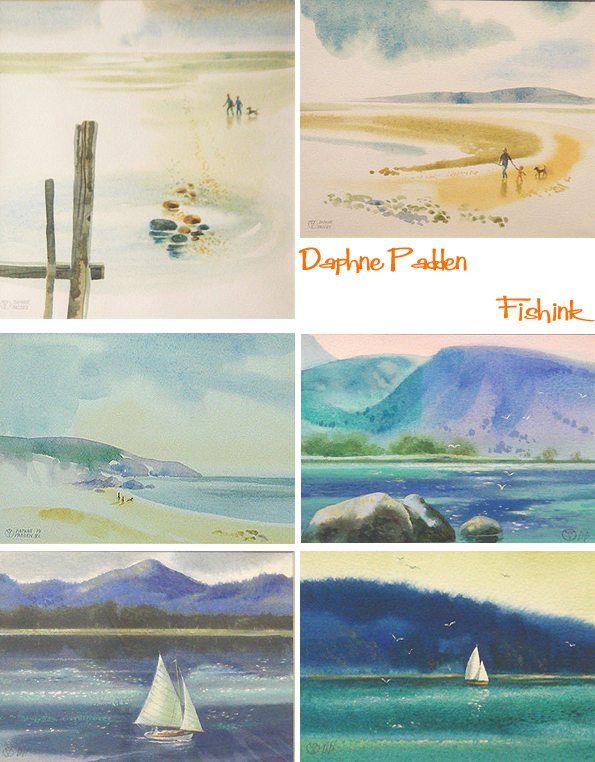 It was way back in 2010 that I first wrote about the advertising work of Daphne Padden. 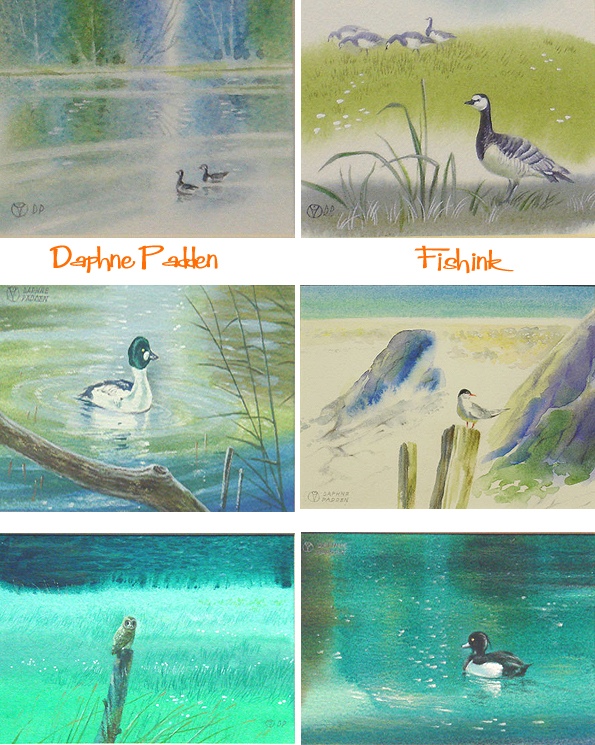 Through that post, Rosemary got in touch who has been organising an exhibition of Daphne’s fine art work. This is currently available to purchase through the Lincoln Joyce Gallery. 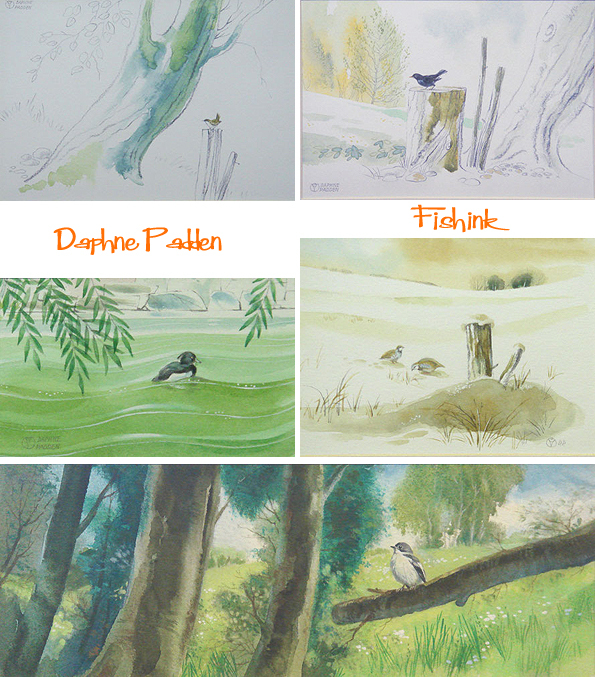 She very kindly agreed to let me use the images and info on that site to share with you as an update on Daphne’s later work. 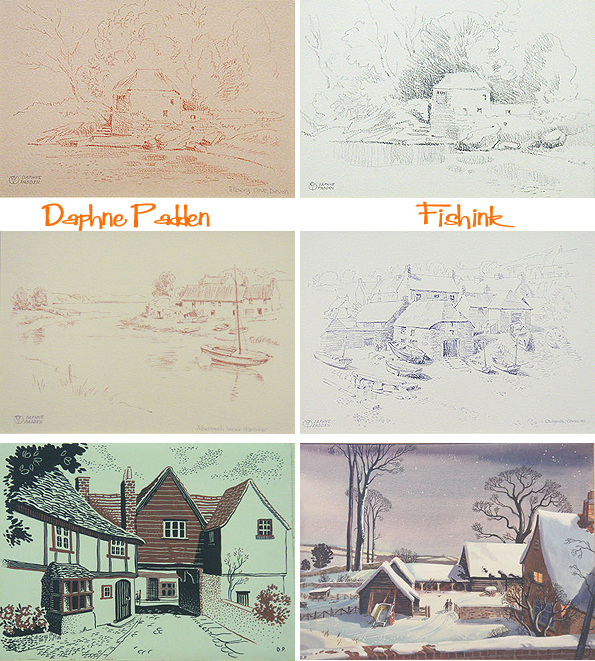 Daphne Padden was educated at Rosebery Grammar School in Epsom and attended the Epsom & Ewell School of Art. After college she became a freelance designer, producing posters and publicity material for the British Transport Commission, the Post Office Savings Bank, the British Diabetic Society, ROSPA, P&O, Trust House Forte and British European Airways. 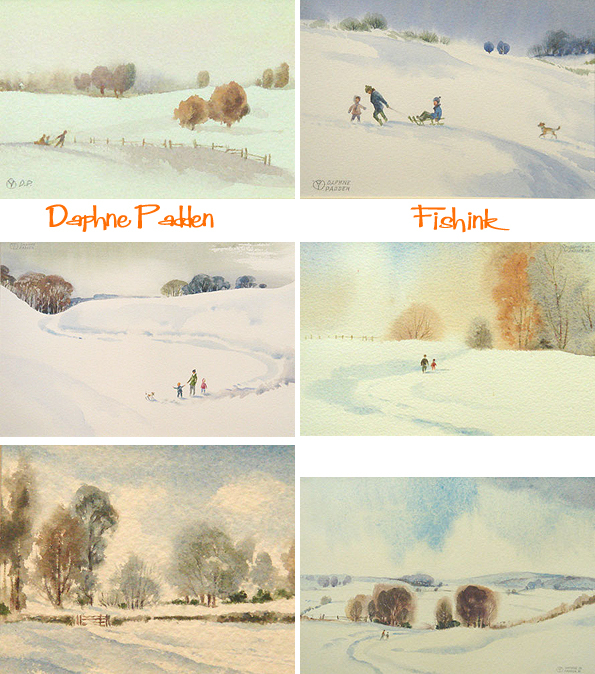 In 1976 she took up painting “for Art’s sake” working in watercolour where her delicate touch in both line and colour gave all her paintings a whimsical feel. 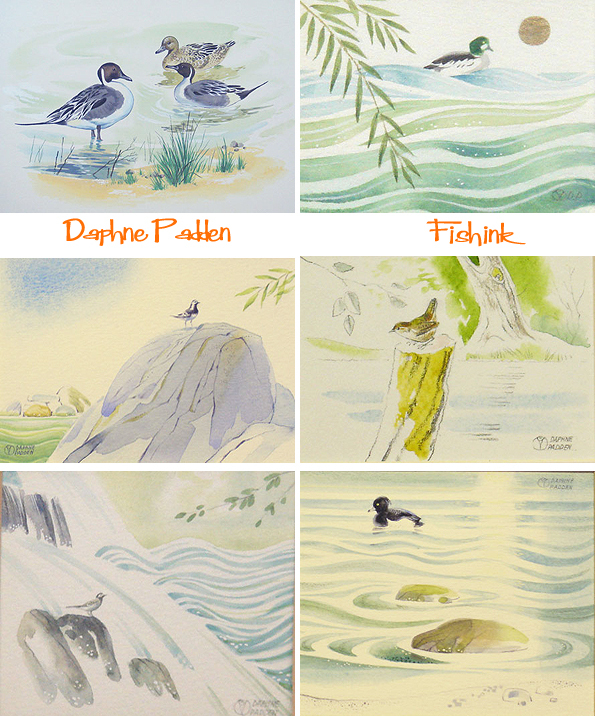 Whether it is her studies of wildlife or landscape, the viewers’ eye is always drawn to the natural balance and extraordinary detail that Daphne achieves. The Padden family originated in County Mayo in Ireland who in the mid 19th Century moved to Wolverhampton in the Midlands working in the iron industries. John Padden from County Mayo came to Wolverhampton where he had 7 children including James Padden , Daphne’s grandfather. James married a local girl Florence Crook from Wednesbury and they had two boys and a girl Percy, Sidney and Lilian Mary. Daphne’s father was Percy Padden who studied at Wolverhampton College of Art and became an Art Master. He was discharged from the Army as unfit after enlisting in October 1917. Discharged on 27th December 1917 in London where he remained, trained at the Royal College of Art and he went on to become one of the foremost poster designers of the early 20th Century. Percy worked for the Post Office producing sumptuous works advertising cruises on Mail Boats. In the First Wold War the family was subject to a scare when Percy’s cousin Thomas Bernard Padden who had joined up, was posted and formed part of the expeditionary force into France. Thomas was gassed and reported “missing” in April 1918. It was his wife Maud Padden (nee Browning) who wrote to the military to say he was alive as she had had a card from him to that effect. He survived the war but died shortly after in 1925 having had two children Gwendoline and Clifford. A Padden marriage in 1917 caused a rift in the family due to religious differences, very prevalent in those days. This left part of their family estranged and isolated. It may have been unconnected or due to a clerical error but in late 1917 Percy listed his religion as Church of England in his Army papers, clearly an error as the family was Catholic. This was certainly not known to his cousin John Padden and his family who were isolated by the rest of the Padden family for his marriage to a Protestant, Leah Bradley. Percy married Marie Kate Bateman in Lambeth in 1924. Daphne was born in Lambeth. She studied art and design under her father at Epsom and Ewell School of Art. 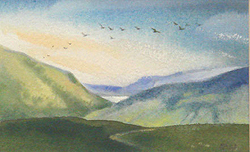 Working for British Transport Commission, the Post Office Savings Bank, the British Diabetic Society, ROSPA, P&O, Trust House Forte and British European Airways.She was one of our gallery artists. Daphne was always a very gracious lady, she undervalued her work and was always modest about her achievements which were considerable. She did not drive and always traveled distances by bus. Little more is known about Daphne but she was elected a member of the Royal Society of Miniature Painters, Sculptors and Gravers in 1984. Her work is exhibited in galleries throughout the South East and London. I hope this helps in showing her and her work in their correct place in art history. 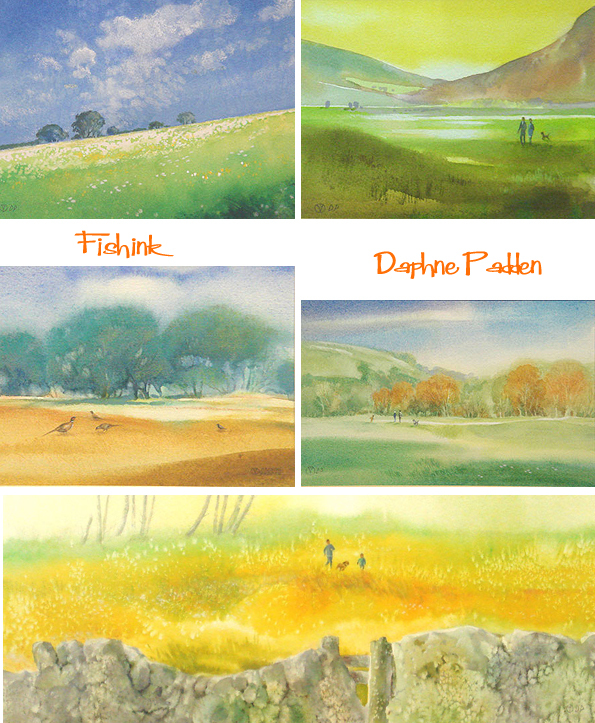 She has a wonderful sense of style and a great command of both watercolour techniques and landscapes. It’s wonderful to see such a change in style, from her work bold, blocked colour layouts for adverts in the fifties and sixties. You might be surprised to discover that some of these pieces are miniatures, measuring just a couple of inches. You can pick up an original here from as little as £80 ! Thanks again to Rosemary for letting us all appreciate Daphne’s stunning paintings, and for also fitting another piece into the jigsaw of her life and work. More links to Daphne’s advertising work on Allison’s Flickr set here and over at Quad Royal here. Enjoy. 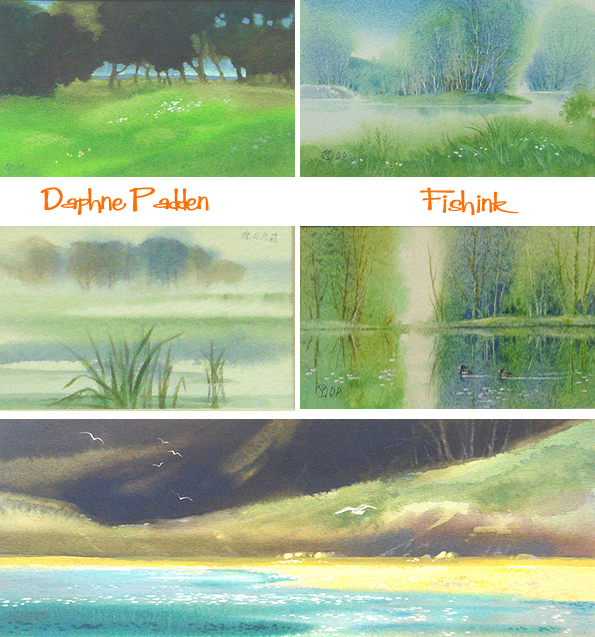 I love this artists paintings. They are unique, crisp, playful and airy feeling. My grandad was John Padden who married Leah. He died in 1937 and Leah in 1970. They had 3 children one, ken (my dad) is 91. I’ve been following the Padden family tree and found out about Percy and Daphne. I love their work and would love to find out more. Hi Lesley, thanks for your message, how fab to be connected to such a talented family. All I know about Daphne, I’ve gleaned from the internet. If you type her name into the search box on the right of my blog you’ll see those posts appear. Happy searching.